That’s right. The Mann triplets are all boys! I don’t know what to think. Again. This keeps happening. I have no idea what to do with boys so of course they are all boys. I guess we’ll learn. Today we went to our big appointment with Dr. Wendell. He’s a maternal fetal medicine (MFM) doctor, or a high risk specialist. Everyone in Little Rock recommended him because he’s really good – actually he’s the best. I was really against a male lady doctor but because he’s the best I didn’t have to think twice about it. Only the best for my babies! We had a big ultrasound that looked at the full anatomy of each baby. I say “big” because it was an hour long ultrasound on the Level 2 ultrasound machine. They’re definitely boys! The first 3 pictures from our ultrasound photos from today are penises. I won’t share them on here but if you don’t believe me just ask. I can prove it. Trying to keep it PG on here! All 3 babies are looking great still. Baby A and Baby B weigh approximately 7 oz. each and Baby C weighs approximately 8 oz. This is what they are supposed to weigh if you were wondering. Also they all measured within 1 day in gestational age which is perfect. The ultrasound technician checked all of each baby’s organs and limbs. (They are all there. Yay!) They were pretty mobile today and moved around a lot. 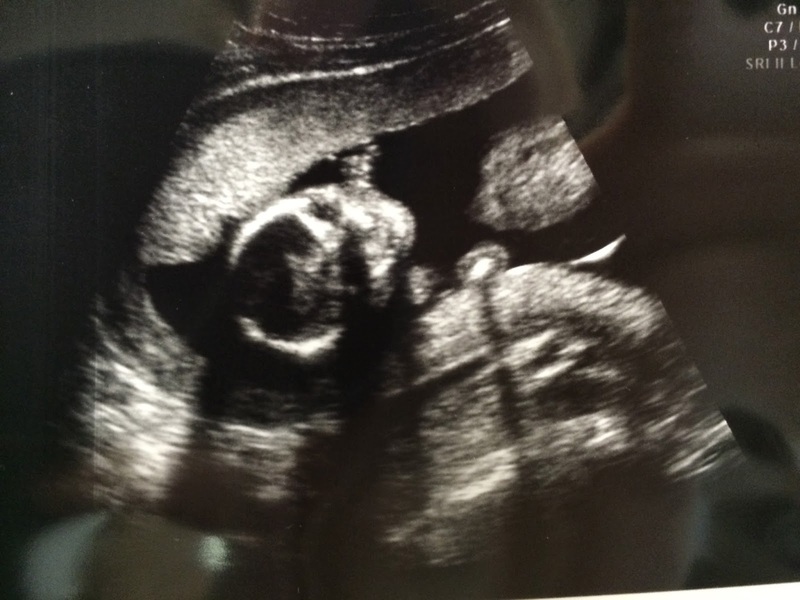 Baby A completely switched from one side to the other during his ultrasound. We got lots of pictures and a DVD today. I teared up a little at one point. This is the first time that’s happened to me with this pregnancy. I was way more emotional with Addison. Here are some pictures. And we got to see them in 4D today too! I wasn’t expecting this so it was an awesome surprise. All 3 boys like to keep their hands by their faces so we got a good shot of Baby A and Baby C in 4D. Baby B was hiding close to his placenta so his picture isn’t as good. But it’s amazing how much you can see in these pictures! The scary news of the day – Dr. Wendell is really worried about preterm labor. I apparently have all of the risks – (1) triplets (2) low pre-pregnancy weight and (3) history of preterm labor with Addison. My water broke at 30 weeks with Addison and she was born at 32 weeks. Dr. Wendell thinks the babies will definitely come before 32 weeks, which is average for triplets. To put things into perspective, my uterus is about the size of a normal single baby uterus at 30 weeks already! And my body doesn’t know that I have 3 babies in there. This is pretty scary to me. Good news is that I’m bigger than I ever got with Addison already. 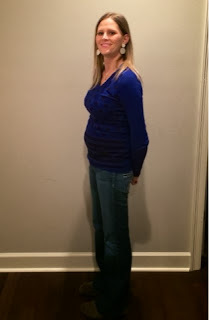 Dr. Wendell said the goal is 30 weeks (May 14). Brian and I are still hoping for 32 weeks (May 28 – our anniversary). Dr. Wendell said ideally I would be a 240 lb. 6 foot tall black woman. Exactly the opposite of myself. Pretty much he just meant that the babies need lots of room. And I’m not a good size for that right now. Hopefully I’ll get there! Please pray that I can get big and fat for these babies! Seriously. I can diet and exercise later. So basically I have to take it easy and get fat. Dr. Wendell wants me to gain 60 lbs.!! That means lots of ice cream. We went straight to Sonic after the appointment and I got a Reese’s blast and chili cheese tater tots. Yum! Also I’m not allowed to exercise. Not even yoga. Good thing I didn’t really like yoga. Any extra exercise takes calories away from the babies. And they need lots of extra calories so they have plenty of room to grow and stay inside as long as possible. For now I’m going to keep working and doing normal stuff (just with more food). I will likely be put on some form of bedrest around 24 weeks or shortly thereafter. The doctors will reevaluate this as we go along. I am staying with Dr. Dora as my primary doctor for now. That’s good news. Dr. Wendell has been reviewing my file and ultrasounds as I’ve had appointments up to this point and he will continue to do so. I will see him and Dr. Dora from here on out though. Dr. Wendell wants the ultrasounds at his office so he can view them live and look himself if he so chooses. I’m pretty happy with this decision too because that means he’s right there if something comes up. 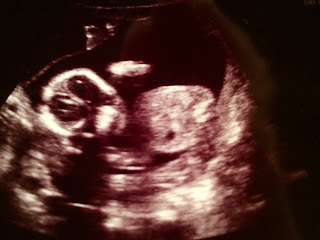 So right now we’re scheduled to go back to see Dr. Wendell on March 28 for another ultrasound. We’ll see Dr. Dora sometime before then. And the babies will have names soon. I promise to share them. Also, if you have name suggestions, keep them to yourself. I don’t really care. Brian and I are naming these boys ourselves. Not trying to be mean! Just honest! So we are 18 weeks today (tomorrow if you are reading this on Tuesday night). The babies are supposedly the size of bell peppers! According to my internet research, the babies should be around 7 oz. each this week and about 5 1/2 inches long! That seems a little big to me, but I guess I don’t feel very small anymore so maybe. I had a regular checkup with Dr. Dora Tuesday. She said everything is going great! All 3 babies have perfect heartbeats. Yay! And Dr. Dora checked to see if they are boys or girls again. She confirmed what we learned last week. Baby A is a boy, Baby B is a boy and Baby C is a girl. She’s almost 100% sure about Baby A and Baby B. We’ll confirm Baby C on Monday when we go to the high risk doctor. Dr. Dora gave us a brief overview of this visit so I think we’re ready. Also, I gained . . . 11 pounds this month! Whoa! So that’s 12 lbs. total through 18 weeks. Dr. Dora is very happy with that. Brian is too. I can tell he’s relieved because he was so worried that I didn’t gain any weight during the first trimester. Here are some pictures of the babies. In reverse order so C can go first for once. 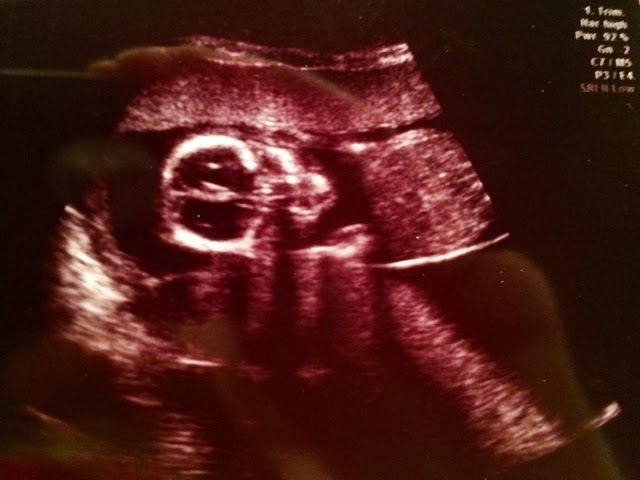 Baby C – you can see her little arms by her face! Baby C’s tiny feet! So precious! 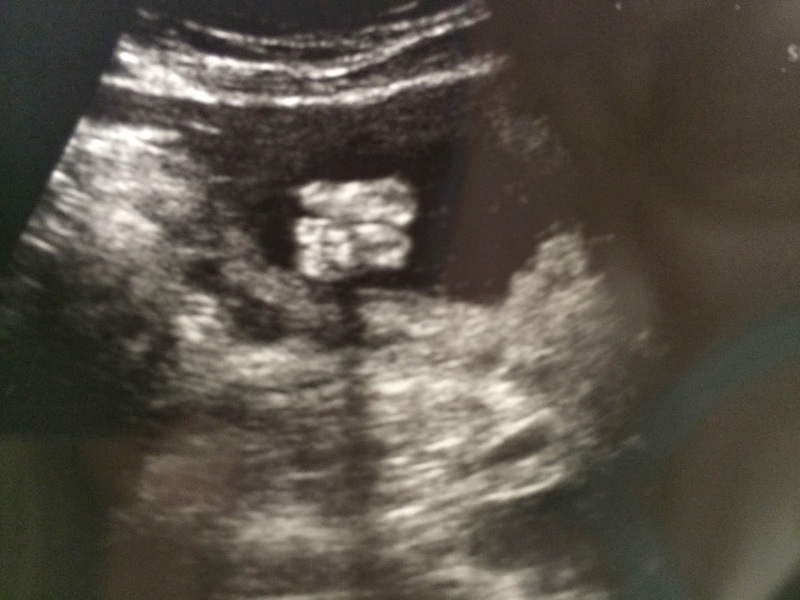 Baby B – looks like he’s smiling! I love getting to see my babies at every appointment! Dr. Dora is the best ultrasound picture taker! She gets each baby’s face every time! I kind of wish she could go with me to the Level 2 ultrasound! Biggest event this week . . . I outgrew my regular clothes and had to stop buttoning my pants. Remember last week when I said I had court and wasn’t sure if any of my suits still fit? Well they don’t. I found this out Wednesday night and I had court Thursday morning. Luckily I had already bought a belly band so I wore that over my unbuttoned suit pants. And I left my shirt untucked. I hope the Judge wasn’t offended! I won my motion and the a judge gave me everything I asked for so I guess I was ok. I felt like a slob though. I had to wear a suit Friday too. Also unbuttoned with the belly band and untucked shirt. I felt more comfortable that day though for some reason. I think the shirt I chose Friday made me really look pregnant instead of just unprofessional. Who knows really. After the realization that I can’t keep wearing my clothes much longer I went shopping on Saturday. Not fun. I like shopping for clothes but this was different. I had a very limited budget and most of what I tried on looked terrible on me! If you’ve never been pregnant and had to shop for maternity clothes, this compares to swimsuit shopping somewhat. I did find a few things I can stand wearing. And luckily for Brian I skipped the front of the maternity clothes store where they keep the designer jeans. I’m kind of a jeans snob if you don’t know. But I don’t pay full price ever. And I’m not starting now! If someone has some designer maternity jeans I can have I would be your BFF forever. For real. But no pressure. Did you hear about the woman in Mississippi who thought she was having triplets then delivered quads? Surprise! How did they not know?! I mean I’m 18 weeks and I’ve had 6 ultrasounds already. That’s just crazy to me. But what if it happened to me?! I asked Dr. Dora and she said something isn’t right about this story. She said she’s positive I am only having 3! 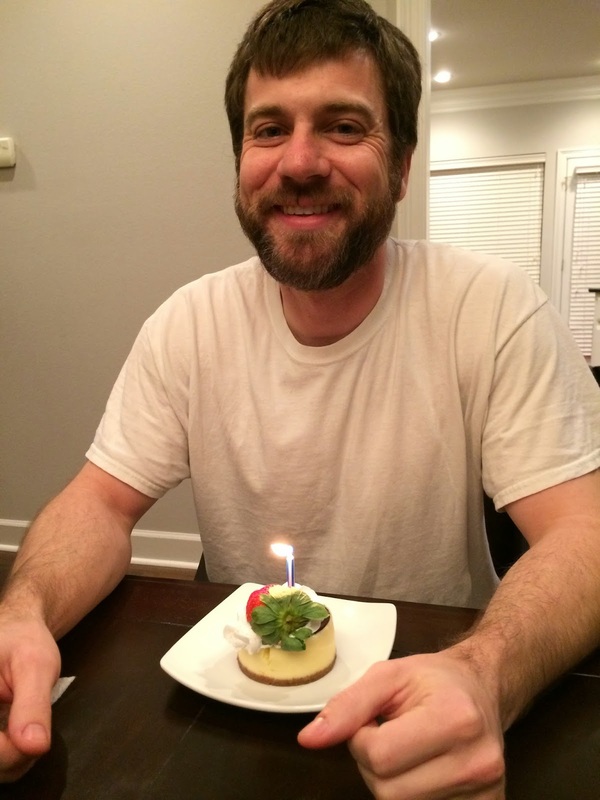 Also, today is Brian’s birthday! He’s 33 if you’re wondering. For his birthday he got to go with me to see Dr. Dora. And he got to see his babies too. And I cooked him dinner. He said he didn’t want anything for his birthday but he got a few gifts too. Here’s a picture of Brian with his mini cheesecake I didn’t make this but I wish I could make tiny cheesecakes. I can only make full-sized cheesecakes and then I have to eat a full-sized cheesecake because Brian usually only eats one piece and Addison doesn’t really like cheesecake. She called the crust cinnamon dust! Ha! She’s a mess. 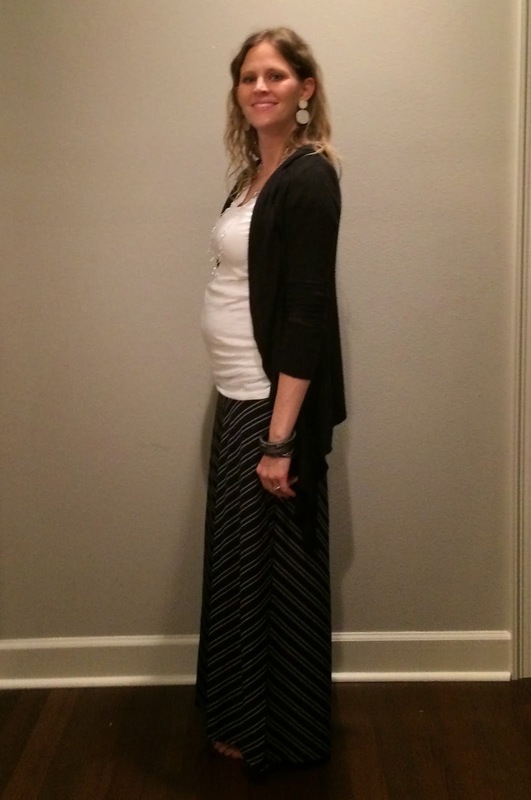 And here’s a picture of me in my maternity clothes. I feel like I’ve gotten so much bigger this week! Maybe I have. Yesterday my favorite jeans wouldn’t button 😦 I was pretty sad. And very thankful for the belly band so I could still wear them. Next Monday is the big appointment with the high risk doctor. We’ll confirm the gender of all 3 babies then too! Then I can start baby shopping. Don’t tell Brian. 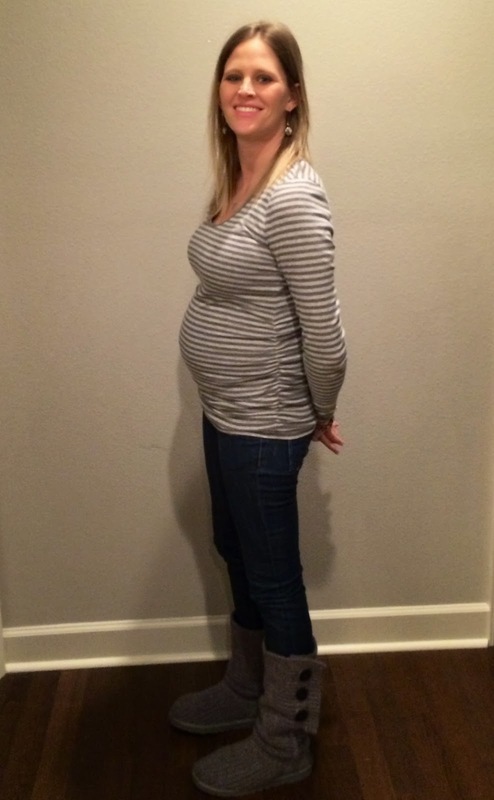 17 Weeks – Almost Too Busy to Post! 17 weeks today! Sorry I don’t have any fruit comparisons today. None of my weekly pregnancy emails told me this week and I did not have time to go out and actually research this. The only reason I am actually posting this today is because I wrote a draft yesterday. Just got home from work at 9 and just now eating dinner at 9:30 (I did eat at work too so don’t get too worried).But supposedly they are the size of turnips? That doesn’t help me at all. I also think the turnip comparison is for weight. They should be 5 oz. (and they are!!) And supposedly they will double in size in the next few weeks according to some unnamed internet sources that I looked at before today. We had the follow up ultrasound yesterday. I was worried the appointment would be cancelled because the weathermen were predicting SNOW!! But we got nothing. Of course. We did get snow Friday night though. About 4 inches. 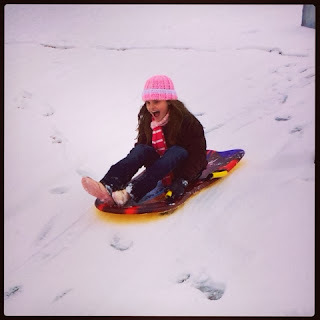 Addison loved it! I love this picture. Pure joy. This is why kids are so awesome. Me? I just watched because Brian said the babies weren’t allowed to go sledding. But it was so worth it to see Addison’s excitement. 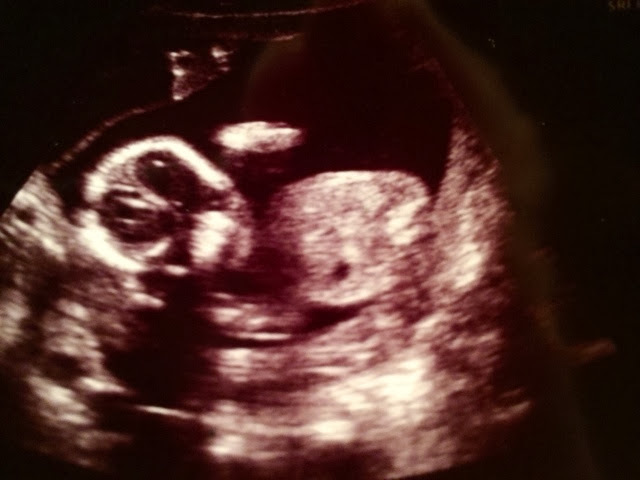 Now that my ADD moment is over … Back to the ultrasound. This one went so much better! We checked their size, heartbeats and amniotic fluid. All 3 babies are doing perfectly! Perfect heartbeats and fluid. And all 3 weigh around 5 oz. That’s the right size according to the ultrasound technician. They measure size by measuring each baby’s head, belly and femur. They don’t measure length anymore though so I don’t know how long they are. Oh and we looked for sexes today too. This isn’t definite still but … Baby A looks like a BOY, Baby B looks like a BOY (again) and Baby C looks like a GIRL (still). I asked how sure she was and she said 80%. I’ll take it. Brian’s happy because with 2 potential boys he’s thinking they’re probably right about at least 1 of them. I think they’re probably both boys. She pointed out the penises. Weird that there are baby penises growing inside me but I’ll deal with that. Baby A looks pretty clear to me. Baby B isn’t as clear but that’s the one Dr. Dora thought was a boy before. Here’s a picture of Baby B from yesterday. So cute! Looks like he’s sucking his thumb! I hope he doesn’t end up sucking his thumb like Addison! It’s cute but really hard habit to break. Brian finally got Addison to stop when she was 5! Of course his first attempt worked too after I had been trying for years. We also got our cribs this week. They came on Monday while I was at work. And Brian built them already!! Obviously I’ll put them in different places but they’re in the room! It’s getting real to me finally. 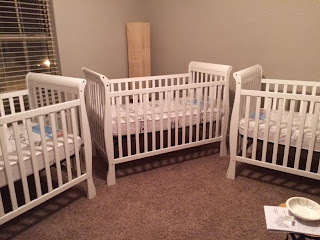 We have 3 cribs! We’ll order the bedding once we find out for sure if they’re boys or girls. Brian finally told me his names yesterday. I’m not sharing any names though so don’t ask. Also no one else gets a say in case anyone was wondering. Next Dr. Dora appointment next Tuesday. 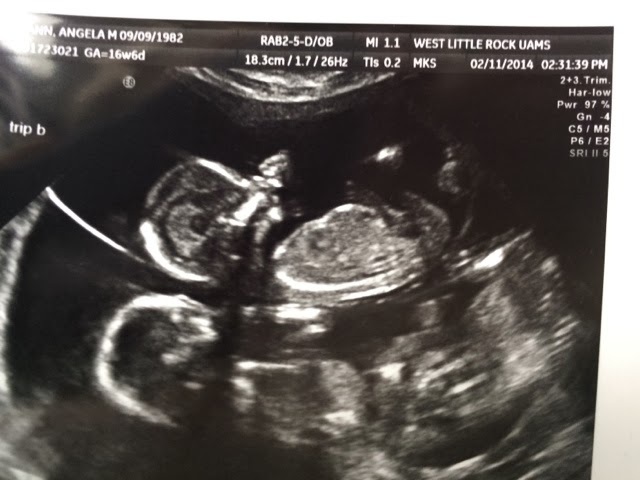 Then the next week we go to the high risk doctor and we get a level 2 ultrasound. They’ll check each baby’s full anatomy at that appointment so we should confirm sexes then. I can’t wait! Getting bigger finally. Some of my clothes are starting to get tight too. I’m not happy about that but it’s making the pregnancy feel more real. I had to unbutton my jeans last week after lunch one day but other than that I’m still buttoning my pants. Mostly just my shirts are a little snug and some are even a little short. But I have court in the morning and I have no idea what I’ll wear. Hopefully I can find something court appropriate. I think at least one of my suits should still fit. Also I still love ice cream. Kroger makes Baby Ruth ice cream that is AMAZING! I don’t even like Baby Ruth candy bars but everyone needs to try this stuff. Seriously. Do it. 16 weeks today! I guess we may be half way . . . we’ll see. If these babies are like Addison then we’re half way there. Anyways, the babies are supposedly the size of avocados this week (for Keith who likes the fruit references). This was a rough week for me. I mean, most of my pregnancy symptoms are gone now that I’m in the second trimester. Oh wait, that is except the worst pregnancy symptom. For me at least. I am an emotional wreck this week. I also started feeling sick yesterday. Today I sound like a man (apparently a drag queen according to my coworkers but still a man). I guess that means more ice cream though so that’s good at least. And my regular clothes are really starting to get tight so I had to go out and buy some belly bands so I can quit buttoning my jeans pretty soon. If you remember, I had an ultrasound appointment on Monday. I was really excited about this appointment and have been looking forward to it since my last appointment. We were going to get to see the babies on the big ultrasound equipment AND we were supposed to confirm the sexes of the babies. But that didn’t happen. In fact, nothing really happened except they measured my cervix (looks good by the way so yay!). We left the appointment more confused than before. I didn’t even get any pictures! When the ultrasound technician (I assume that’s her title) came in she asked if we knew the sexes because apparently everyone at the doctor’s office has been wondering. We said we were supposed to confirm that today. So she checked. Kind of. She didn’t look too hard in my opinion. At least not compared to the last ultrasound girl or Dr. Dora. So here’s what she told us – Baby C looks like a girl and Baby B looks like a girl too! What?! But Dr. Dora said Baby B was a boy! So she checked again and said maybe Baby B is a boy, I’m not sure. So now we don’t know about any of the babies’ sexes. I don’t trust her opinion about Baby C either anymore. She didn’t really check Baby A at all. Then she checked my cervix and said we were done. 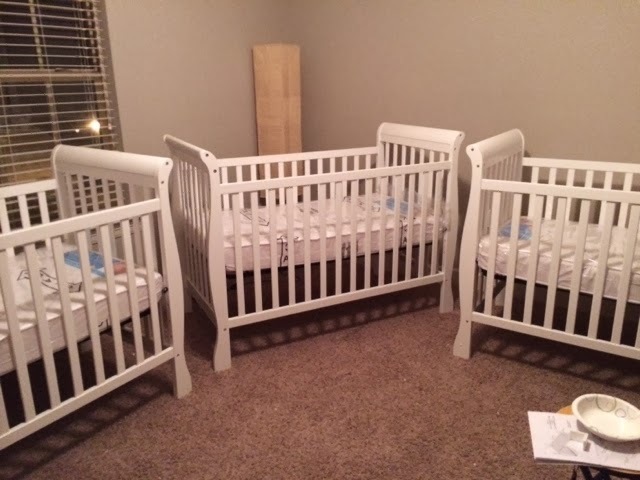 I asked her “aren’t you going to measure the babies?” And she said “No, we just did that so we’re not doing that today.” (we didn’t just do that – we haven’t measured them in a month!) I was kind of in shock so I didn’t question her at the time. The more I thought about it though, the more upset I got. I mean, my understanding was that we would get these stronger ultrasounds every month to check the babies’ measurements. We need to make sure they are all growing at the same rate right? And she didn’t even check their heartbeats! After I got back to work I became very upset. I’m usually a laid-back, go-with-the-flow kind of girl but not when it comes to these babies. I am constantly worried that something will go wrong. So of course the more I thought about the ultrasound and how she didn’t even check the babies at all, the more upset I got. So . . . Brian to the rescue! He emailed Dr. Dora and told her our concerns. And it turns out I was right! (I love saying that). They were supposed to check the babies at this appointment. I guess there was some confusion somewhere. But Dr. Dora fixed it. So we have another ultrasound scheduled for next Tuesday. They will measure the babies then and check for sexes then too. Yay! Brian is hoping and praying that Baby B is still a boy I know! Lucky for me I have a great husband and some great friends to support me through my emotional roller-coaster pregnancy. One of my friends even cried because I was upset! I guess she’s a keeper. Other than my emotional state I had a pretty good week. We ordered 3 cribs and 3 crib mattresses on Amazon yesterday. They should be here by the end of next week! Yay! We also had a “snow day” yesterday. I put “snow day” in quotations because we didn’t actually get any snow. We got freezing rain for a few hours so the roads were a little icy and we stayed home. I got up at my normal time and worked from home for a while. But I did get to rest some which was really nice. This past weekend Addison and I went out to lunch and had some Mom and Addison time too which was nice. I wish we had time to do this more often! Oh, and I’ve gotten to eat lots of ice cream this week too.